We have updated the design of this website for you! Based on CT/CBCT scans of the patient, the bone block is virtually designed using the latest 3D CAD/CAM (computer-aided design/computer-aided manufacturing) technology. maxgraft® bonebuilder offers greater precision and accuracy of fit compared to classical block augmentation. Manual adjustment of the block during the operation is seldom required and maxgraft® bonebuilder may be applied directly onto the defect, reducing surgery time as well as risk of infection.1,2 The individual design provides a precise fit between local bone and the allogenic bone block, enabling rapid revascularization and fast graft incorporation. 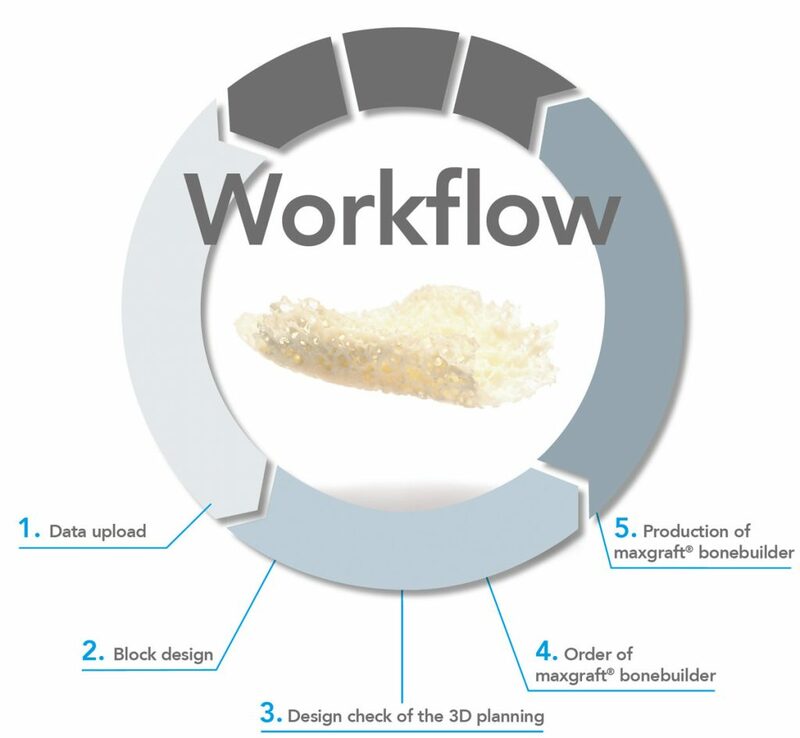 maxgraft® bonebuilder is planned in close interaction between clinical users and botiss CAD-designers with multiple feedback loops to ensure an optimal fit. Communication is mainly done via email using the comment section on the specific order web page. maxgraft® bonebuilder is produced at the Cells+Tissuebank Austria (C+TBA), a non-profit organization aiming to provide allogenic transplants for orthopedic and dental regeneration situated in Krems/Austria. maxgraft® bonebuilder is 100% human donor bone and originates from femoral heads (taken during hip endoprosthesis surgery) of living donors from certified procurement centers in Europe. The Allotec® process, a gentle process with volatile agents only, has been proven to eliminate potential pathogens, without destroying the natural bone structure. Thus, C+TBA allografts exhibit excellent biocompatibility and outstanding handling properties without even a suspected case of disease transmission. 1 Jacotti et al. 2014. Posterior atrophic mandible rehabilitation with onlay allograft created with CAD-CAM procedure: a case report. Implant Dent. 23(1):22–8. 2 Blume, O. et al. 2017. Treatment of Severely Resorbed Maxilla Due to Peri-Implantitis by Guided Bone Regeneration Using a Customized Allogenic Bone Block: A Case Report. Materials 10(10): 1213. 3 McAllister, B.S. et al 2007. Bone augmentation techniques. Journal of Periodontology, 78:377-396.